The world’s oceans are in constant motion. A complex web of currents steered by winds and the rotation of the earth carry warm water from the equator towards the poles and cold water back towards the equator. By redistributing heat around the world, these currents profoundly affect our climate. For example, warm-water currents such as the Gulf Stream are responsible for the relatively mild temperatures in northern Europe. The interaction between currents and climate is receiving a lot of attention, especially given the prospect of global warming due the buildup of greenhouse gases. Scientists are focusing on how a possible warming of the air and water might affect ocean circulation and how shifts in the currents will in turn impact the global climate. Some researchers have even speculated that global warming could trigger the shutdown of the currents carrying warm water north, plunging northern Europe into a deep freeze. To make confident predictions, however, scientists still need to work on the basics. While satellites have tracked the warm-water currents at the surface of the oceans, scientists are only gradually piecing together the complicated networks of cold deepwater currents. Amy Bower is one of the scientists working on this puzzle, one small piece at a time. 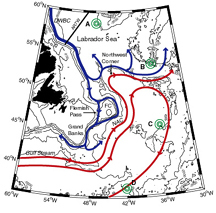 Circulation in the northwest Atlantic at the depth of the Labrador Sea Water. Arrows indicate mean currents. Blue is cold water. Red is warm water. Amy has focused on water flowing from marginal seas—small oceans such as the Mediterranean Sea, Red Sea, and Labrador Sea that are perched at the edges of the large oceans. Water originating from these small seas may influence the larger oceans and their currents. The Mediterranean Sea in particular has attracted a lot of attention. Its waters are extremely salty due to low rainfall and high evaporation. Some scientists speculate that water flowing from the Mediterranean contributes enough salt to the Atlantic Ocean to depress its freezing point and keep the far north Atlantic ice-free. Without a layer of ice, the water radiates more heat into the atmosphere, moderating the climate around northern Europe. Scientists are therefore interested in the volume of salty water entering the Atlantic from the Mediterranean and how it is dispersed. But instead of finding a steady flow of salty water fanning out of the Straights of Gibraltar, they discovered pockets of swirling warm salty water deep below the surface of the Atlantic. These eddies (dubbed meddies for Mediterranean eddies) form when the denser salty water of the Mediterranean meets the Atlantic water, sinks, and begins rotating clockwise. Measuring from 40 to 150 kilometers in diameter, these packages of salty water can drift through the Atlantic for several years before breaking up on seamounts or slowly decaying. Amy’s research has focused on where and how frequently meddies form and where they go once they enter the Atlantic. To answer these questions, she and her colleagues deployed neutrally buoyant floats about 1,100 meters deep off the south coast of Portugal. Beacons anchored on the ocean floor track the floats by emitting sound signals. The floats record the exact time they receive the signals from each beacon. By calculating the time it takes for the sound to reach the float, scientists can calculate each float’s position as it drifts with the current. After about a year, the floats drop their weights and rise to the surface. They then transmit their information, including data on temperature and salinity, to satellites. The researchers then download the information onto computers and chart the path of each float. Amy at sea relaxing on deck. Amy and her colleagues were for the first time able to observe the formation of meddies off Cape St. Vincent on the southwest corner of Portugal where the westward current makes a sharp turn to the north along the Portuguese coast. Other meddies formed further north near Lisbon. They then turned toward the west and southwest. Most eventually collided with seamounts. 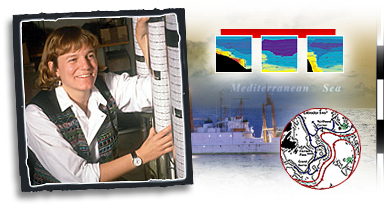 Amy has also helped track Mediterranean water that is not caught up in meddies. She has helped lead cruises to the Gulf of Aden off of the Arabian Peninsula to study the formation of eddies that carry salty Red Sea water into the Indian Ocean. Amy likened these trips to the Indian Ocean to a trip to the moon because so little is known about the currents in that region. She has gone to the far north Atlantic to study the icy deepwater currents originating in the Labrador Sea and to investigate the deep western boundary current as it passes under the Gulf Stream on its way south. These coldwater currents are just as important to the earth’s climate as the spread of warm water near the surface. Amy has contributed to our knowledge of ocean circulation despite being legally blind. While a graduate student, she was diagnosed with macular degeneration, an incurable eye disease that attacks the central portion of the retina. Although her peripheral vision remains intact, she has difficulty reading normal-sized print, recognizing faces, and seeing objects at a distance. Special computer monitors and voice software have helped her view and interpret text, charts, and images. But it’s been her perseverance and passion for her work that has enabled her to lead research cruises and make an impact. According to Amy, the interactions between the ocean and the atmosphere are extremely complex. The more scientists learn, the more they discover how complicated the system is. Predicting the consequences of global warming on ocean circulation and climate therefore remains dicey. But by beginning to fill in the gaps as Amy has done, scientists will be better prepared to recognize and track changes to the currents. Amy says that if global warming continues, we could face some big changes. But she does offer some comfort. The ocean’s currents have a lot of momentum. Changes will come slowly. Therefore it will probably take a long time for any changes to significantly alter our daily lives. Read an interview with Amy. Get more info on Amy's background. See images of Amy at work. See Amy's typical work week. Other sites related to Amy's career.